Enter your sea glass beach report in this box. Just click and type! You can delete these prompts when you're done. Was not expecting to find any glass on our trip to Tofino and Ucluetet. The many, many beaches are fine sand - most beachcombers are searching for the elusive Japanese Fishing Floats that rarely appear on the beach after massive storms. 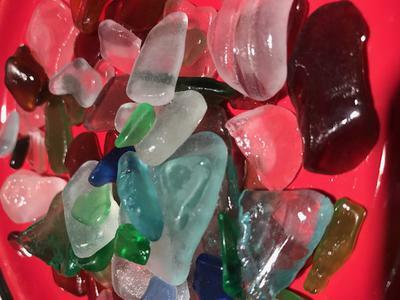 Comments online from other sea glass hunters were they were disappointed and have gone home empty handed. We stumbled across Terrace Beach - part of the Terrace Beach Resort and found some little beauties!